Affordable luxury with a breath-taking view of the San Tan Mountains. 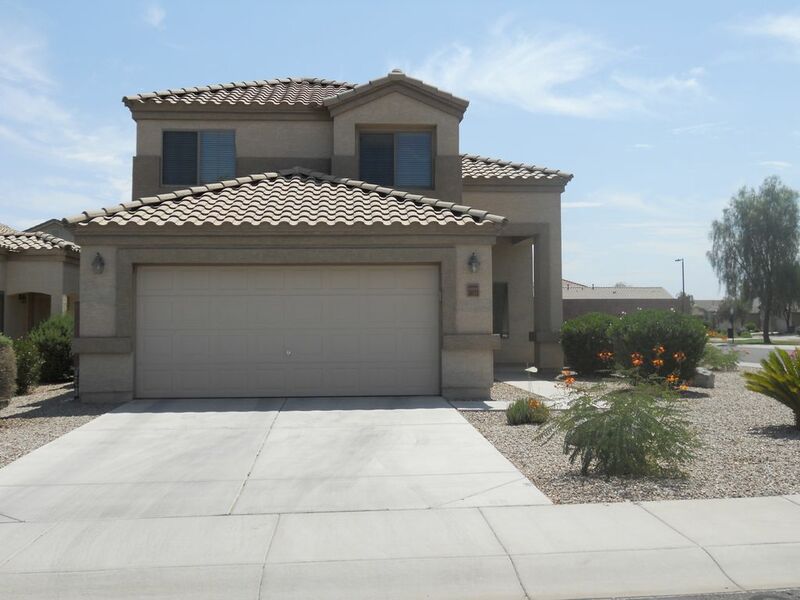 This beautiful home has a wonderful view of the San Tan Mountains. There are four bedrooms and three full bathrooms. The master’s bedroom is so huge that it fits a four-poster bed and still has plenty of room to spare. There are two guest rooms upstairs and another one downstairs. The bedroom downstairs has access to a full bath. There is even a quiet nook upstairs for reading or just relaxing. Downstairs, there is a formal dining room, family room and an open-designed kitchen and dining room. This is an ideal location to spend your winters. You can while away the afternoon in the extended patio in the back. There is also a small playground across the street, perfect for the kids to play catch. Approximately 45 minutes from Phoenix Airport and about 10-15 minutes aways from Mesa Gateway Airport. Camel Back Mountains, Superstition Mountains, Old Town Scottsdale, Grand Canyon Steam train, Casa Grande Ruins, Sedona, Kartcher Caverns, and many more. The house is just a few blocks away from locations such as Wal-Mart, Wells Fargo Bank, Subway, Sonic, and Walgreens. San Tan Village is about 15 minutes away (more than 100 shops). Equidistant to Tucson Outlet and Pheonix Premium Outlet. Please note for long-term rentals, mail can not be forwarded to this address. Renters need to find temporary mail service at local Post Office. This home has a lovely backyard and patio; however, there is no comfortable patio furniture or table. Also, no grill! When contacting the owner, he stated that the description intentionally does not mention much. We travel to this area to be able to enjoy the outdoor weather in Arizona. The master bedroom has a king size bed, but all other bedrooms have full size beds - very small and uncomfortable! The kitchen needs new pots and pans AND cutlery. If the above items were improved upon . . . We would stay here again. The location is wonderful in terms of things to do, shopping, eating out, etc! There are a couple of golf courses nearby as well. Thank you for your review. We have purposefully not included any pictures of the backyard because we didn't want our visitors to have a different expectation of the yard. We originally chose not to have a grill in the backyard because of a possible fire hazard. We have reconsidered and we will now be adding a grill and patio furniture in the future for the convenience of our guests. We apologize for any inconvenience. I was originally going to write that "we regret that you found the size of the beds to be too small but we are very transparent about our information on the VRBO website. Our description states that we have three full size beds and a king size bed in the master's bedroom." However, upon checking our add, it does say "Queen size" in the other rooms. We can only guess that must be the default description when we renewed our subscription to VRBO. That was not how we listed it years ago. We will probably not change the size of the beds because this is what fits the needs of our family. That was our preference for our vacation home. This is our home that we have chosen to let other families enjoy when we are not using it for ourselves. However, we will definitely add additional cutlery and pots and pans in the the kitchen. Once again, we apologize for any inconvenience. We have never had a negative review in all the years that we've been sharing our home with guests. We value your input and we will make some changes based on your suggestions. Thank you. We enjoyed our stay for the month of February. Dominic's house is clean, comfortable in a very safe area. It is 4 bedrooms with 3 full baths. It sets up nicely for 3 couples with their own bath and the bedrooms are nicely separated for privacy. Each bedroom has its own TV. The kitchen is fully equipped and we ate most of our meals at the house. It does not have a BBQ but does have a crock pot. The backyard is gravel for low maintenance but there is a community center. I'm not sure if the renters are allowed to use the facilities. We are golfers and enjoyed the many golf courses in the Queen Creek area. Would highly recommend as we found it an excellent value with a good owner. We are highly pleased that you enjoyed your stay. Thank you for your kind comments. We purposefully tried to keep low maintenance features in our home so that our renters can enjoy their stay with peace of mind. Currently, the community center is only for full time residents/owners. Thank you for your input. We will add patio furnitures soon. Looking forward to having you come and visit us again soon. Lovely home. Wish master bedroom was on the first floor. Thank you for taking care of our home. When we first saw the place, we fell in love with the location. At the time we bought the house, our kids were still in middle school so we wanted the entire family upstairs. We also wanted to have our visitors to have privacy downstairs which is why we have a bedroom with an independent bathroom. Our kids are off to college now but we are glad that the original intent of the house still serves its purpose i.e. to have a wonderful home that is centrally located that our guests could enjoy in comfort and convenience. Thank you. it was the perfect place for an old couple with handicaps and their adult daughter and son-in-law. The house was well kept. The area was quiet and the neighbors seemed pleasant. The house was large enough for all of us to have our own space. Dominic was very obliging and quick to answer questions and give help whenneeded. We spent two months in this home and enjoyed our stay. It is close to grocery stores, drug stores, and other critical outlets. With four bedrooms and 3 bathrooms, it is ideal for large families or big groups. This was a beautiful house house with all the comforts of home. Booking with Dominic was easy and communication leading up to the rental period was clear. Would recommend to a family or several couples and location is great. Rates are subject to change until reservation is confirmed. Instructions about the house and detailed contract will be emailed upon confirmation of dates. Minimum stay is one week. Discounted rate may be available for monthly stay.